The 73rd Ohio Volunteer Infantry Regimental Band, directed by John M. Huffman, will again perform at Sidney’s Civil War Living History Weekend, Sept. 15-16, in Tawawa Park. 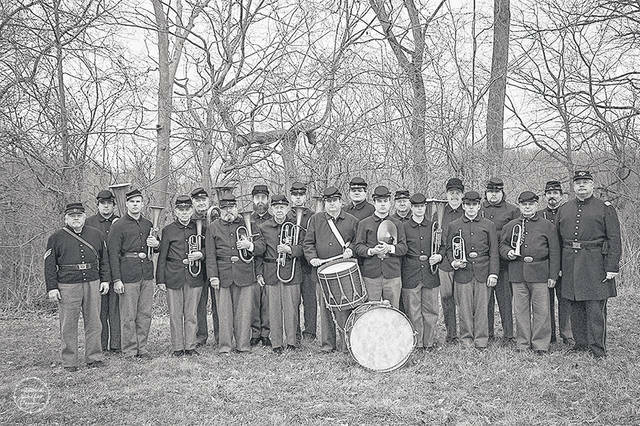 SIDNEY — The 73rd Ohio Volunteer Infantry Regimental Band will return to Sidney for the Civil War Living History Weekend, Sept.15. The band performed at the inaugural event in 2016, and will be back by popular demand. The 73rd Ohio Volunteer Infantry Regimental Band will perform at 9:30 a.m. in downtown Sidney and again at 7 p.m. in the Geib Pavilion located in the Baumgardner Basin in Tawawa Park. It will also provide limited musical selections Sunday morning, Sept. 16, following the Catholic Mass and during the Methodist worship service. The 73rd Ohio Volunteer Infantry Regiment Band, in its current form, was established in 2011. The organization exists for the purpose of enriching and entertaining the modern public with historically authentic music and playing techniques contemporary to the time period of the War of the Rebellion. Its music is presented, whenever possible, through performance with instrumentation typical of authentic military regimental brass bands of the Civil War era. The 73rd Ohio Volunteer Infantry Regiment Band is based in Waverly. Members of the band hail from throughout Ohio. At the start of the Civil War, there were few military bands. The few that did exist included the U.S. Marine Band, The U.S. Military Academy Band, several Regular Army regimental bands and bands associated with state militias. Militia bands were very highly valued by the local militias as they participated in musters, ceremonies and parades and were useful in recruiting soldiers. As state and local militias were mustered into regular service, they naturally took along their bands. Within a few months of the start of the war, Congress authorized the creation of regimental bands for the Regular Army. The War Department issued General Order No. 48, July 31, 1861. It entitled two field musicians (buglers or fifes and drummers) per company (80-100 men) of soldiers and a band of 16 to 24 musicians for each regiment (800-1000 soldiers). This led to the formation of hundreds of bands and the enlistment of thousands of musicians whose duties were solely to provide music for the Army. The musicians were considered noncombatants and initially had few duties outside their musical ones. These brass bands played a significant role in the life of soldiers. They were the pride of their units, and it was acknowledged that they provided a boost to morale that was so badly needed. Later during the Civil War, military bands often were assigned battlefield chores. Those chores included serving as stretcher bearers, assisting in medical operations and even assisting with the burial of the dead. Sidney, Ohio’s Civil War Living History Weekend is scheduled for Saturday, Sept. 15, and Sunday, Sept. 16, in Tawawa Park. The event is free and open to the public.